Here’s a film whose trailer is better than the film itself: as Chris Kyle (Bradley Cooper) has a child and woman in his sniper sights and they prove to be a threat to his squad heading towards them, images of his life back home, with his own children and wife, haunt him as he has to make a decision on life and death all by himself. That’s just about the gist of American Sniper, though it’s padded out with reasonably bland over-East action and back-home drama, the likes have been accomplished so much better by plenty of other war films, which leaves me with two questions: what is the point of this film, and why has it edged out the likes of Nightcrawler and Gone Girl for a Best Picture Oscar nomination? I suppose the answer to the first question is to commemorate the life of Chris Kyle, the most lethal sniper the American military ever produced. Controversy has arisen over the disparity between the character of Chris Kyle and the actual Chris Kyle, the film making this man a much more empathetic and accessible bloke for a wide audience (and what a wide audience it was, with that impressive box office opening). Bradley Cooper’s performance is very good and fully formed (physically and emotionally) and he’s continuing with, alongside Matthew McConaughey, one of the most startlingly improving career trajectories that we’ve pleased to see. However, he’s rather underused here as his character, playing the “hardened soldier” character with the easiest and most accessible of tropes. Not to say that the presentation of Kyle’s mental anguish in his off-duty days don’t hit hard, but the repetitive structure of this character going to war, coming back from war a slightly changed man, grew a bit tiresome without showing much development, leaving me wishing this film had been titled Four Tours and a Funeral so I could have an idea of how close it was to finishing its overstayed welcome. But by the last scene, things picked up with the film’s easy, but essential path towards optimism pushed itself away from its similarities and offered up catharsis and even solutions to any audience member that has been through war (whether they were enlisted or not). Oddly enough, there have been plenty of folk out there complaining about this overly American film (what were they expecting with a title like that?). This amount of exaggeration and misinterpretation of American Sniper (from the left and right) would have you thinking Cooper is gunning down Middle Eastern women and children then high-fiving himself and winking at the camera as he erects an American flag above every mosque his squad dominates. Clint Eastwood is not a director who leaves his moral compass on the table when he directs a film, and that’s the case again here. Cooper’s Kyle does some horrendous acts when put under pressure and the whole last act of the film is him dealing with the fatal monstrosities he should or should not have done. 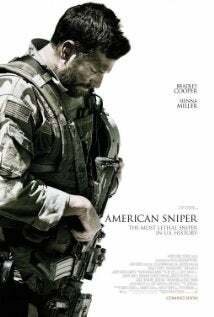 I guess people are looking into this film too deeply as, again like the title suggests, American Sniper is purely about a man himself (and the tellers of this tale will tell you themselves).